Hi there. I’m back from my vacation and I have a new tutorial. 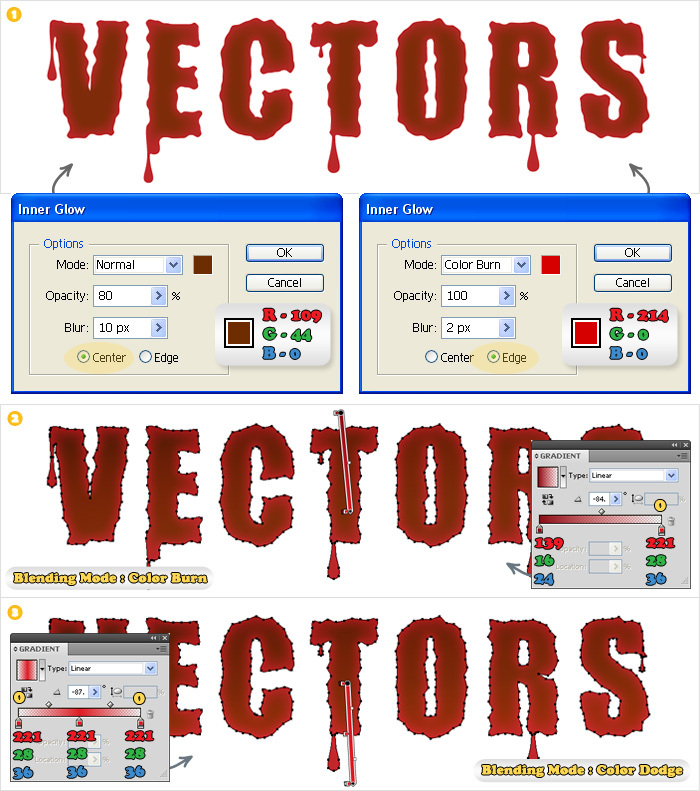 In the following steps I will show you how to create a simple blood text effect. You’ll start with a simple text then you will use the Roughen and the Warp effects. Finally, you will need multiple gradients and some simple brushes. 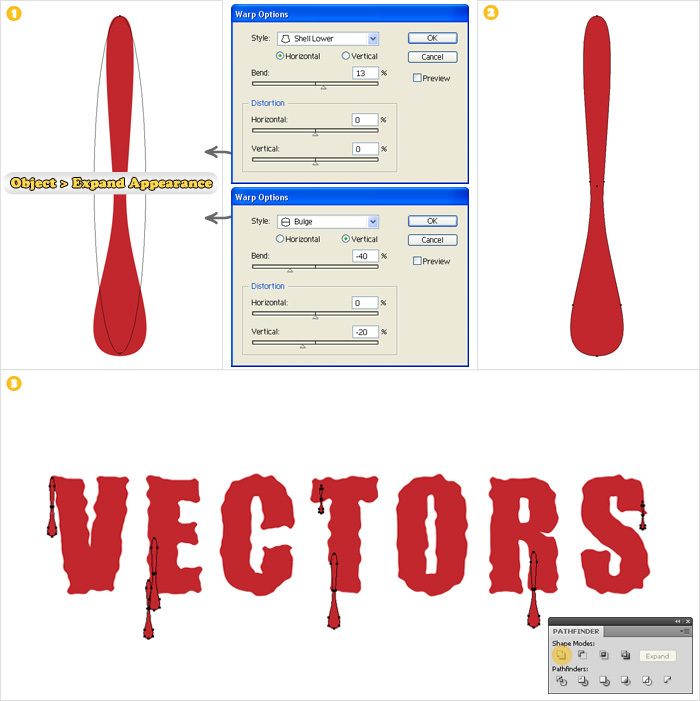 Create a 700 by 300px document then select the Type Tool and add your text. Use the Impact font with a size of 130px. Select this text and go to Object > Expand Appearance. Fill the resulting shapes with R=193 G=39 B=45. Next, select these shapes, add the Roughen effect (Effect > Distort&Transform > Roughen) and once again go to Object > Expand Appearance. Don’t worry if your shapes do not look like those shown below. It’s because of the Relative option from the Roughen effect. Now, reselect these letter shapes and go to Object > Path > Offset Path. 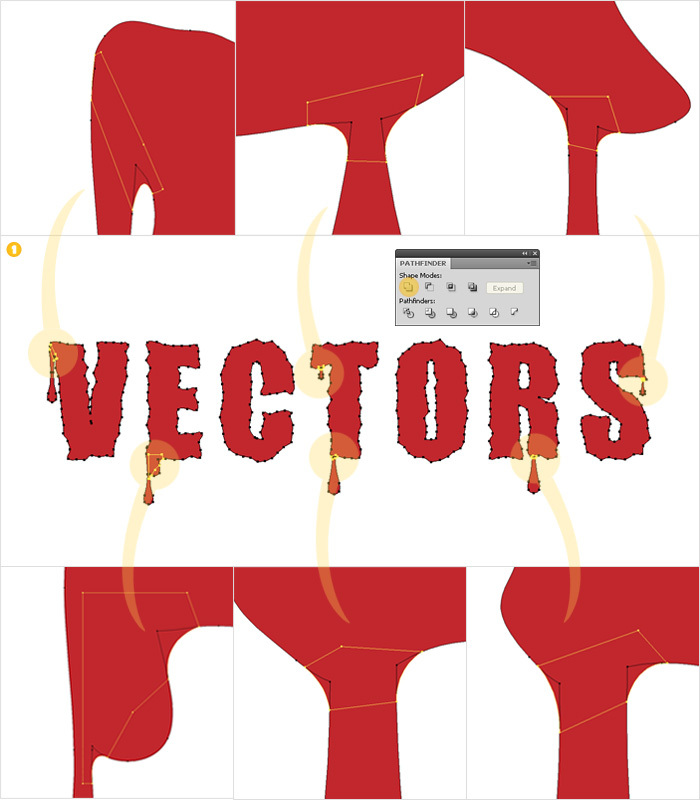 Enter a “-10px” Offset and hit OK. Group the resulting shapes. Name this group “Screen” and make it invisible. You’ll need it later. Now, let’s create the blood drips. 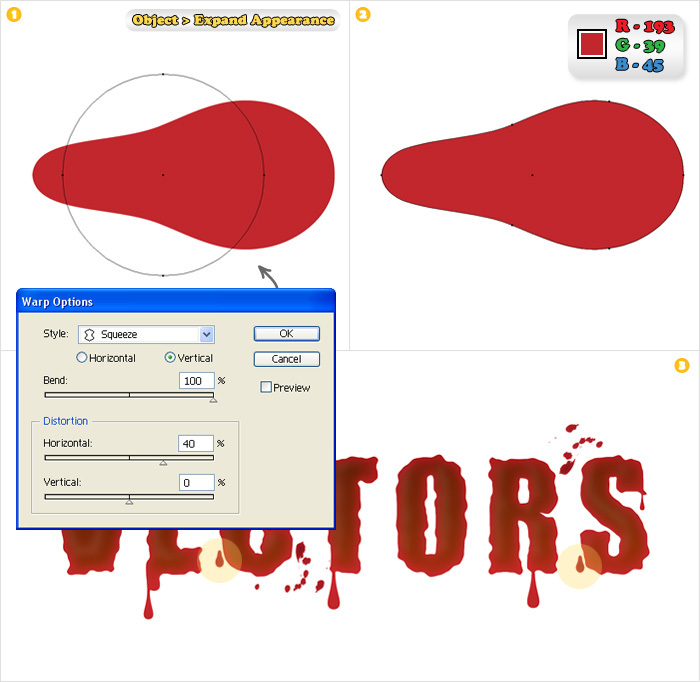 Select the Ellipse Tool(L), create a squeezed shape (as shown in image #1). Add the Squeeze and Bulge Effects (Effect > Warp..) then go to Object > Expand Appearance. Fill the resulting shape with R=193 G=39 B=45. Create several copies of this new shape. Resize these copies and try to place them like in image #3. 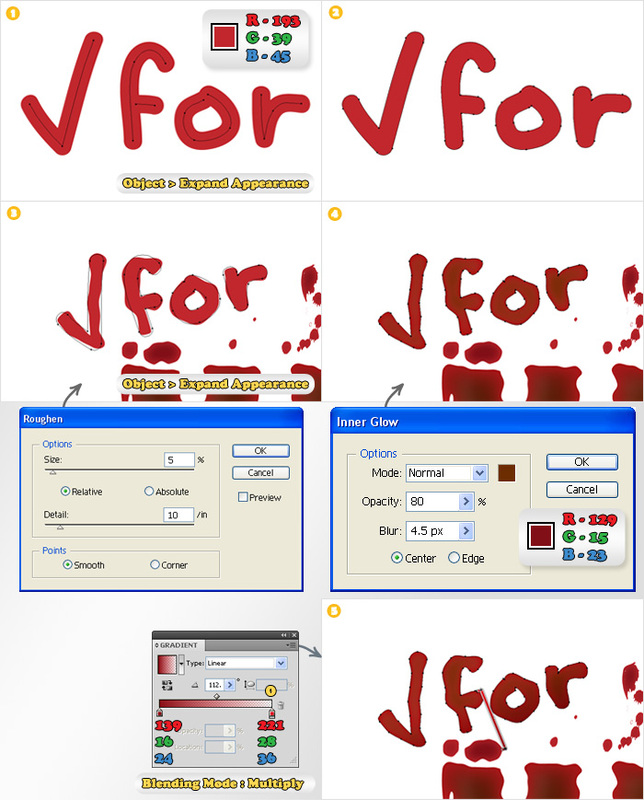 Now, use the Unite button from the Pathfnider panel to unite the blood drips with the letter shapes. 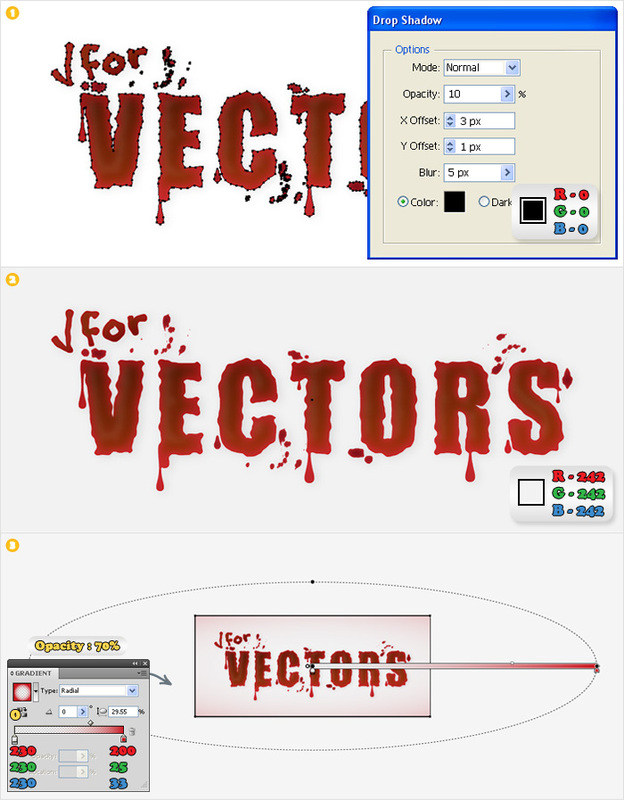 Select the Pen Tool(P) and use it to create the group of shapes shown in the following image. It should add a bit of roundness for the area where the drips meet the letter shapes. Once again use the Unite button from the Pathfnider panel. 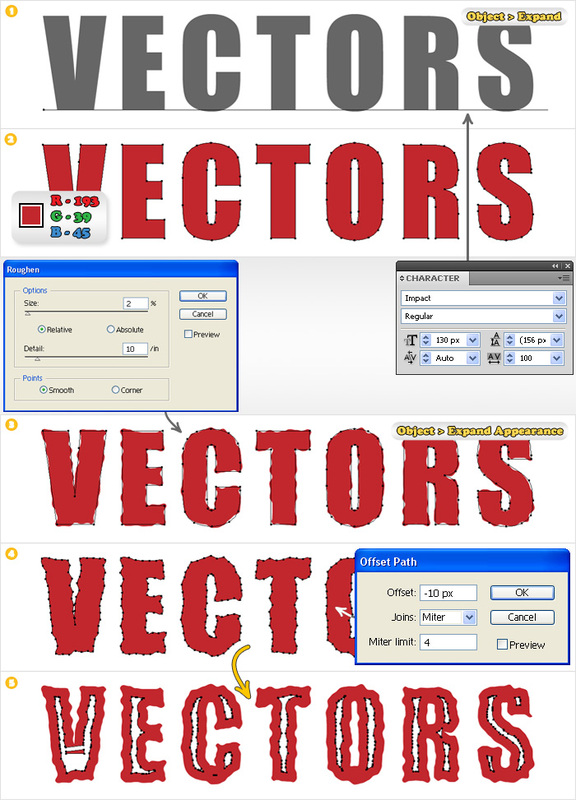 Select all these letter shapes and go to Object > Compound Path > Make. Name this new path “Letters” and make sure that it’s still filled with R=193 G=39 B=45. Next, add the Inner Glow effects shown below image #1. Create a copy of “Letters” (Ctrl+C > Ctrl+V). Select this copy and erase the Inner Glow effects. 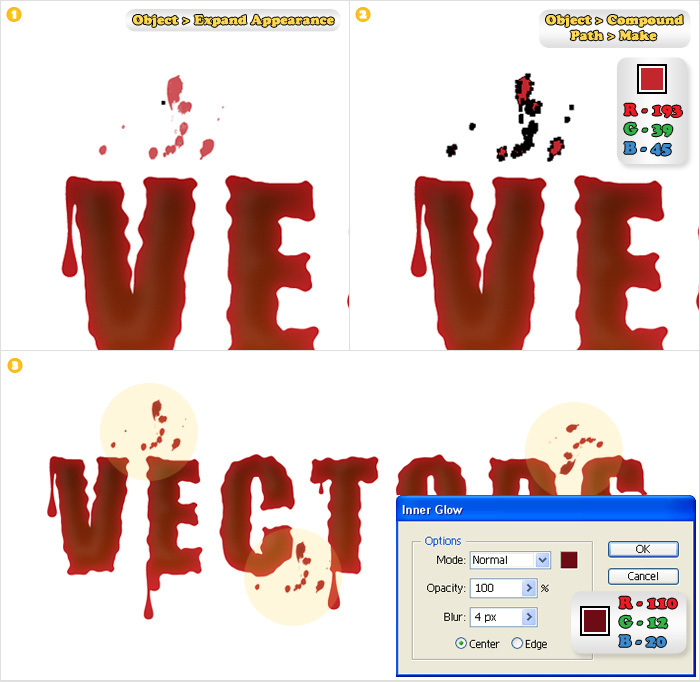 Fill this shape with the linear gradient shown in image #2 then add a new fill (from the fly-out menu of the Appearance panel) and use the gradient shown in image #3. Select the first gradient (from the Appearance panel) and change it’s blending mode to Color Burn. Finally, select the second gradient and change it’s blending mode to Color Dodge. Turn “Screen” back to visible then bring it in front hit (Shift + Ctrl + ]). Fill all the shapes with white. Next, select the entire group and move it a few pixels up and to the left (use the arrow buttons). You might need to edit the “V” shape a little. Reselect the entire group and add a 3px Gaussian Blur. Finally, change its blending mode to Screen then lower its opacity to 8%. 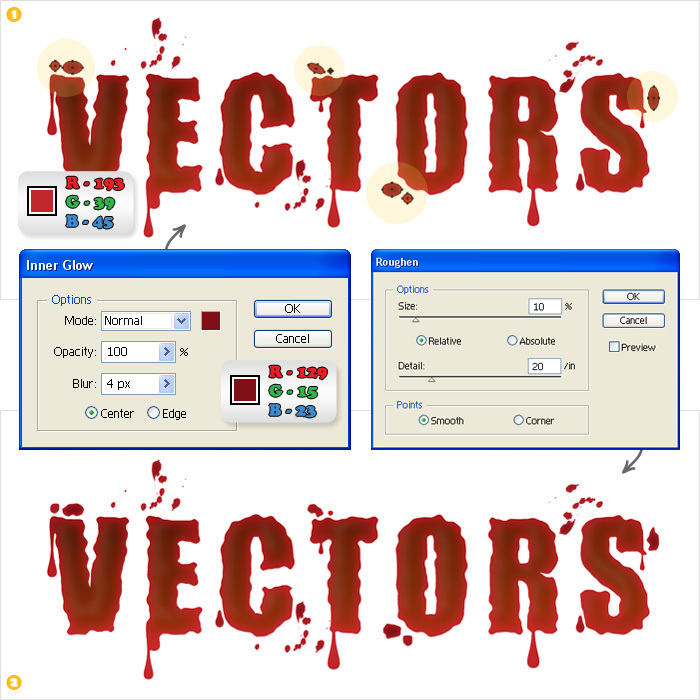 Open the Brushes panel, click on the flyout menu and go to Open Brush Library > Artistic > Artistic Ink. Select the “Ink Spots” brush, pick the Brush Tool(B) then simply click one on your Artboard. Select this path and go to Object > Expand Appearance. Select the resulting shapes and go to Object > Compound Path > Make. Fill this new path with R=193 G=39 B=45 then add the Inner Glow shown below. Crate two new copies then rotate them and place them like in image #3. 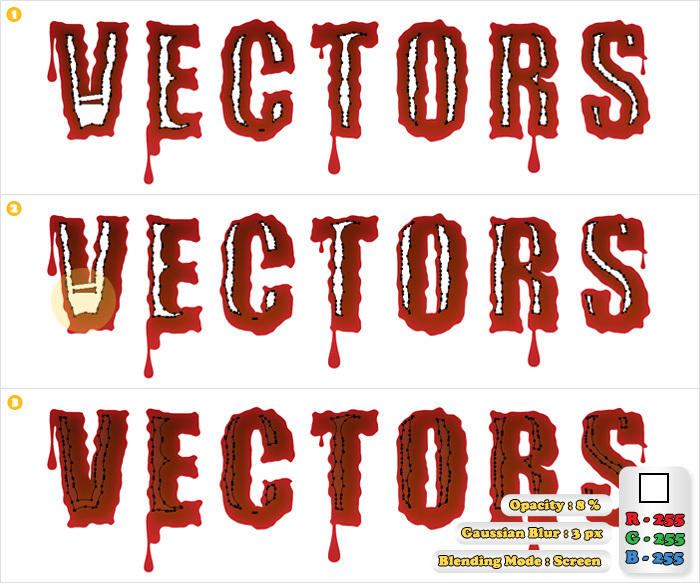 Let’s add some other discrete blood drops. Select the Ellipse Tool(L), create and ellipse (as shown in image #1) add the Squeeze effect and go to Object > Expand. Fill the resulting shape with R=193 G=39 B=45 then duplicate it. Rotate these two shapes and place them as shown. You can also add a discrete Inner Glow effect. Once again select the Ellipse Tool(L) and create some random circles (as shown in image #1). Group these shapes, fill them all with R=193 G=39 B=45 then add the Inner Glow and the Roughen effects. Pick again the Brush Tool(B). This time, select a 7pt Round brush adn use it to create a small text like the one shown below. Double click on the Brush Tool if you want to make some changes in the behaviour of this tool. Select these paths, go to Object > Expand Appearance. Fill them all with R=193 G=39 B=45, add the Roughen effect then go to Object > Expand Appearance. Select the resulting shapes and go to Object > Compound Path > Make. Select the fill (from the Appearance panel) and add the Inner Glow shown below. Next, add a new fill and use the linear gradient shown in the final image. Do not forget to chage its blending mode to Multiply. Select all the shapes created so far and duplicate them. Select these copies and go to Object > Compond Path > Make. Move the resulting shape in the bottom of the Layer panel (Shift + Ctrl + [). Fill it with white then add the discrete Drop Shadow shown in image #1. Finally, the background. Select the Rectangle Tool(M), create a 700×300 shape, fill it with R=242 G=242 B=242 and move it in the bottom of the Layer panel (Shift + Ctrl + [). Add a new fill for this rectangle and use the radial gradient shown in the final picture. Lower it’s opacity to 70% and your done. So sick 😀 but I love it! I can’t seem to click Expand Appearance in step 1 no matter how I select the text created. Any help? Thanks! Try Type > Create Outline. Let me know if it worked. Sorry for the late response, I´m in vacation. 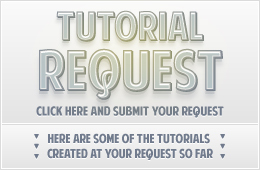 i wonder if you could fill my blank of sizes in terms of creating various realistic object…. Can you be more explicit. I’m not sure that I understood your request.